MotiveWave Software is a well-established developer of easy-to-use full-featured charting, analysis and trading software built for the individual trader. MotiveWave has very advanced charting and drawing tools that are customizable, and specializes in advanced analysis tools like Elliott Wave, Fibonacci, Gartley, Gann and Ratio Analysis. When I left the world of institutional trading on Wall Street/ Bay Street, I set up a trading desk in my husband’s office location and traded futures contracts for my own account for two years. This was in the late nineties. I can remember exploring the data feeds/ trading and charting platforms that I would need to acquire to go about building my trading business. I settled on my charting software which was state of the art at the time. The only caveat was that it cost $2,500 per month to use the software and the real-time futures data feeds. So be it. I was all in. Fast forward twenty years and wow, has the world changed, especially with the online trading capabilities offered today. 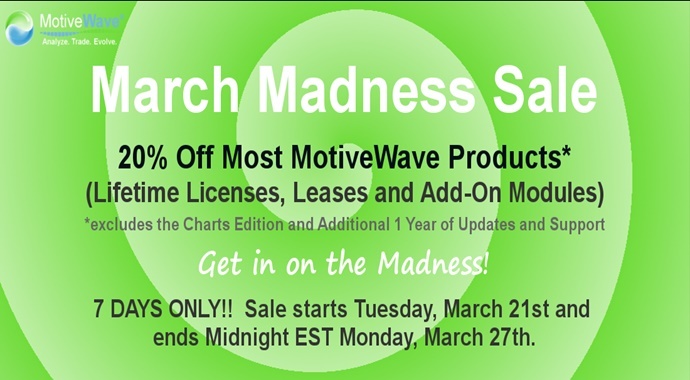 Now I use MotiveWave for my charting platform and I no longer pay such exorbitant monthly fees to use the software! Data is also virtually free since I primarily trade forex and stock markets and not futures. With this huge paradigm shift, the individual investor now has access to all the tools institutional traders have. I decided to take a pause from analyzing another indicator from the MotiveWave suite of indicators, because I wanted to highlight the software, since there is a 20% sale going on this week through Monday, March 27th. Please click to TEST DRIVE THIS POWERFUL TRADING SOFTWARE. Console – use the console to organize your charts, watch lists and positions all within one window with a variety of layouts and pages to customize to meet your specific needs. Order Management – orders are easy to place and adjust, integrated seamlessly with your selected broker. Manage orders directly from the console. Workspaces – MotiveWave allows unlimited workspaces to be able to connect to multiple brokers/ data sources simultaneously. Custom Instruments – combine the historical and real-time prices of two or more instruments to create your own spreads, ratios and index to monitor your stock portfolio, for example. Elliott Wave (EW) – tools range from manual to automatic Elliott Waves to suit your style. Labels are automatically added and the auto EW tool will fill in EW counts based on a selected area of the chart. The Auto Analyze Elliott Wave tool plots the waves over a range of data, and the Elliott Wave Scanner (pattern recognition) allows you to search across multiple symbols based on the patterns you choose. Harmonic Shapes – 24 Gartley bull and bear components can be manually drawn, semi-automatic or automatic to suit your preference. Shaded areas and ratio label guides allow you to easily place points on the chart to load up the patterns correctly. The Gartley Scanner (pattern recognition) allows you to search for patterns across multiple instruments based on the patterns you choose. Gann Analysis – 29 Gann components, including Gann Fan, Wedge, Angles, Ratio Grid and more to perform time and ratio analysis. Studies – with over 275 built-in studies, you are sure to find what you are looking for. MotiveWave has a lot of advanced study features to provide you with the flexibility that you need. For example, studies of different bar sizes may be displayed on the same chart. Strategies – use strategies to fully or partially automate your trading with over 30 strategies made available out of the box. Create your own strategies using java SDK. Replay Mode – test an automated strategy or practice your Elliott Wave counts. Advanced replay mode can be used to simulate a trading environment using historical data. Strategy Backtesting – powerful tools enable you to test and optimize your strategies using historical data. Use the wizard-based interface to guide you through the process. 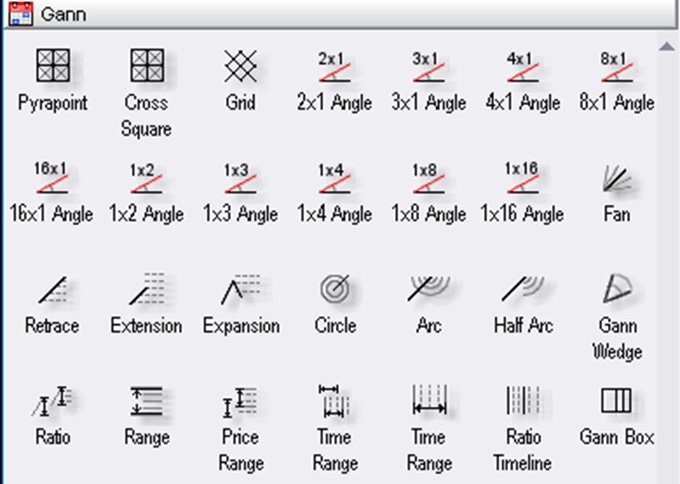 Drawing Tools – over 180 specialized drawing components and dozens of drawing tools to simply click and drag onto a chart to add them to your analysis. Advanced Alerts – highly advanced alert functionality for traders who trade multiple instruments or who want to be notified when an event has occurred such as a price alert, study-based alert, or component-based alert. Manage all the alerts from a centralized location on the console. Scanners – look for trading opportunities across a wide range of instruments and search for Elliott Wave and Harmonic patterns, or study conditions. Bar Sizes & Types – linear bars, second-based bars, tick charts, constant volume, point & figure, range, renko, and hybrid renko. Chart Trading – trade directly from your charts. Depth of Market – the DOM panel displays bid and ask sizes beyond the best bid/ask in a tabular format. Orders can be placed and managed directly from the DOM. Time and Sales – display historical time and sales information directly from the chart panel. Option Chains – trade options using the convenient Option Chain feature. Multiple Monitors – MotiveWave was designed with multiple monitors in mind. You owe it to yourself to test drive this powerful software. TEST DRIVE IT. See you next week for a “C” indicator! This entry was posted in Trading Tips and tagged charting platform, elliott wave, motivewave, trading strategy.